With all the hoopla surrounding the holidays – traveling, family get-togethers, epic meals – it’s easy to plop down on the couch and sleep right through the Times Square ball drop. Before you know, you’ll be writing 2019 on your checks (do people still use checks?) and back to the rat-race routines as we rush into January. But it’s worth pausing – even if just for a few moments – to strategize for the New Year. What resolutions will we be making? How can we make the new year better than the previous one? Well, that’s where we come in. 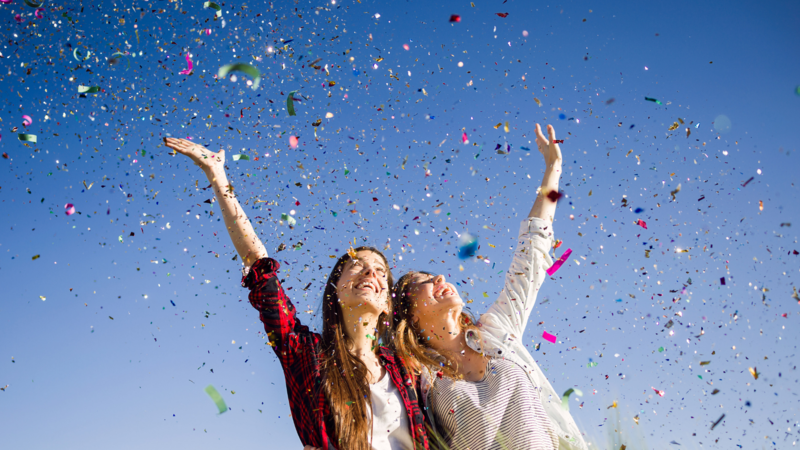 Below, we’ve rounded up 6 ways to inject some happiness into your life in 2019. Some are easy and some might take a little more of an effort, but all of them are sure to bring you joy. In “The Year of Living Danishly,” author Helen Russell discovers that the happiest place on earth isn’t Disneyland, but Denmark. The country has consistently ranked as the happiest country in the world. And one of the reasons is a concept called “hygge.” The Scandinavian country features long, dark and cold winters. But instead of suffering from seasonal affective disorder, Danes turn the season on its head. Often hard to translate, hygge is the overall term for getting “consciously cozy” in winter – staying home, enjoying comfort food with loved ones and lighting candles. Indeed, Denmark burns more candles than anywhere else in Europe. If you’ve ever enjoyed reading a book indoors on a rainy weekend or relaxing with cup of hot cocoa on a cold day, you’ve experienced hygge. Yes, we’re still enjoying the current holiday season. But now’s the perfect time to start planning your next vacation. And it’s scientifically proven to make you happy in the new year. According to Dan Ariely, an Israeli-American behavioral economist at Duke University, we should divide up vacations into three timelines: The time before the vacation, the actual vacation and the time after the vacation. Think of it like this: If you’re planning a trip to Paris next summer, you’ll be spending the next several months getting excited about the upcoming vacation. So even though the trip itself might only last a week, you’ll be getting many months of joy and happiness just thinking about the trip. Similarly, when the trip is over, you’ll be able to spend years looking back at the photos and fond memories from that vacation. The times before and after the trip will end up giving you more joy than the trip itself. It’s statistically proven that time spent planning vacation directly correlates with greater happiness in your personal and professional lives. Case in point was the 2014 news story about a Starbucks in Florida. In that instance, a chain of “paying it forward” customers – that is, one person pays for the drink for the person behind them and so on – lasted 11 hours, with a total of 378 people paying it forward. If you were one of those 378 people, we’re betting your coffee tasted just a little better that day. Studies have shown that being thankful can help you sleep better, make you healthier and is the single best predictor of well-being and good relationships. As David Steindl-Rast, a famous monk, once said, “Happiness does not lead to gratitude. Gratitude leads to happiness.” New York Times bestselling author A.J. Jacobs pounds on this idea in his new book about gratitude. “My innate disposition is moderately grumpy, more Larry David than Tom Hanks,” he writes in “Thanks a Thousand.” “But I’ve read enough about gratitude to know that it’s one of the keys to a life well lived. Perhaps even, as Cicero says, it is the chief of virtues.” After all, gratitude is an attitude.